We have decided to make this exotic young male available...after much thinking and debating... This male has spot-on conformation, heavy bone structure, table top topline, so upright and always posing...and amazing ears! ...along with crazy color! His sire is our tallest stud with amazing conformation and presence. 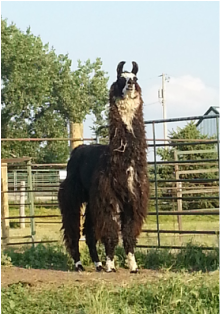 His sire RE Panda Bear is over 72" at the poll. Panda Bear is by *RE Julio, the known champion sire imported from Chile. This male's mother is one of our largest and "wooliest" females. She is a tall, massive female...and an own daughter of *Rebano Escondido Pacifico. *Rebano Escondido Pacifico was considered by some as the best quality male of the RE import. This male is going to be very tall, so correct and so colorful! 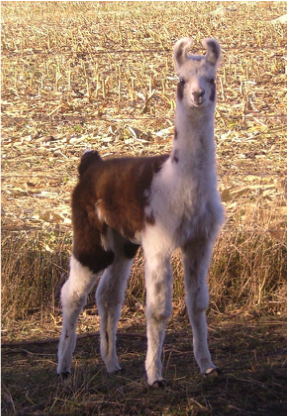 We are not in a real hurry to sell this male but we have bills to pay so have to part with some of the crias from this year. This young male is just starting to fill out and is fiber starting to fill in...he is only going to get better! 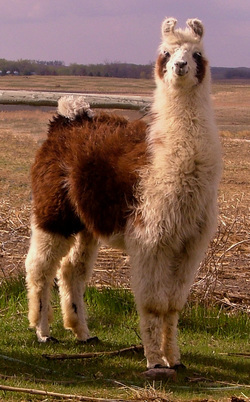 This male is related to very few llamas in the USA... He is product of crossing our tallest and stretchiest male to one of our biggest and heaviest fibered females.